These past few summer months, I have had the opportunity to spend time in many of our local communities. Several of these visits have been for community events, door knocking, parades (16 since May! ), and local organizations gathering together. The enthusiasm I have been met with, as well as the openness of people to share their concerns, has been momentous for my campaign. Whether we have already known one another, or have just met for the first time, I ask that you continue to express those important issues and concerns. Continue to share them with your local and state government officials, so that they can truly represent you. It is the purpose of my campaign to do just that; represent the people of District 5 and keep making Iowa a better place to live, work and raise a family. Strengthen the economy by giving small business owners control and taxing less to give Iowans more disposable income and better family budgets. Create opportunities by encouraging employment locally and allowing our schools to become the best in the nation. Protect our values and rights by ensuring safer communities, decreasing government control, and giving a voice back to the people of Iowa. Let’s work together to make Iowa the best place to live and work! 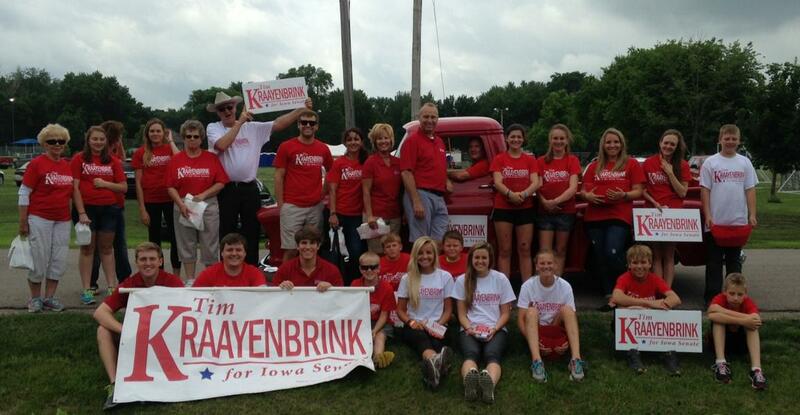 Thank you to all those who have volunteered their time this summer, either for the Tim Kraayenbrink for Iowa Senate campaign, or within your local community. You have all played a role in making our state a better place. I look forward to meeting many more of our community members. Please do not hesitate to contact me or invite me along to an event or organization you are a part of.